Today I want to take a look at a game that got sent to me. The name is Lucid Path. It’s a RPG created by Grevicor. I got a review copy of this game to write this review but the developer asked me to give my 100% honest opinion, so that’s what you are going to get in this article. I’m honestly glad that I’m able to try this game, since looking at the screenshots, I’m quite interested in playing it. Also, the developer told me that this is a very short game that throws the player in unexpected and twisted situations. So, you got my attention. Let’s explore those situations then. And as usual, feel free to write a comment with your opinion on the content of this article and/or the game in the comment section down below. The story of this game starts out quite simple. You are tired of your miserable life and you go set out on an adventure. Luck is on your side, since adventure finds you really fast. You come across a village which has a problem with a nearby dungeon. Now, it’s up to you to solve their problem. Before I continue, I must say that the font chosen in dialogue boxes fits the theming for the game really well. But, it made it tricky to easily see the difference between some letters like the “o” and “a”. Now, I didn’t mind it too much, since I’m pretty fluent in English (…If you need evidence, in what language am I even writing then?) so, I was able to read it without a problem. You go and explore the dungeon and try to solve the problem. You meet several characters which will aid you in your quest. In addition to that, you learn that there is a bigger problem in this dungeon than just the monsters. The writing itself is pretty decent. You meet some other people from the village during your quest. Since the game is pretty short, I don’t want to spoil the ending or any more of the story. If you are interested, I highly recommend that you check it out for yourself. The gameplay of this game is quite relaxing. This game is a casual RPG. The gameplay of this game consists out of playing mini games, choosing when to use your spells and improving your character. Now, what do I mean by “mini games”? When your character takes on a quest, you don’t have to do anything. You play a small mini game on an old computer. Depending on how you do in the mini-game, the faster your character is able to finish the quest. Each time you go and explore the dungeon, you earn coins and medals. With these coins, you can buy better equipment and with the medals you can improve your stats at the castle. Now, you can also earn coins and medals by doing quests. There are 3 quests you can do. After you have done those three quests, you have to go inside the dungeon to get new ones. Before I talk about the dungeon, I want to mention the shop. This part of the game still needs some polishing work. There are two things I disliked about the store. The first thing is that you have to drag & drop from and to your inventory to buy and sell. When you try to sell an armor piece you are wearing, that won’t work. And if you double click on something to buy, that won’t work either. This was annoying while I was using the shop. I get used to it, but I felt like I was doing a click too much. The second thing I disliked about the shop were the colored items. It’s quite unclear with the spectrum is. The ones without a background are the cheapest and weakest ones. Followed by a green background, yellow background, blue background and those with a purple background are the strongest. Now, why not show “lv.1”, “lv.2”… ? This makes it easier to figure out and it also helps colorblind people. Something I did really like about the store is the fact that the inventory of the store is random each and every time. You can refresh the store’s inventory by spending a few coins. I made sure to check the store each and every time before I went to the dungeon to make sure there wasn’t more powerful gear waiting for me in the dungeon. The gameplay in the dungeon is a bit too uninvolved. The battle takes places automatically. There are two things you can influence. The first thing is when you decide to use your spells. You can store 4 spells. You have a fire spell, thunder spell, poison spell… There are a handful of them. You can only use each spell once during your session. The session ends when you are out of health. When you are out of health, you go back to the town. Now, the 2nd thing you can influence in the dungeon is the speed of the game. Now, you can either pause, play at normal speed or play sped up. You even have a button to leave the dungeon early. The leave button isn’t a temporary check point, it’s like a retreat. When you faint and enter the dungeon again, you start at the latest checkpoint. Each five rooms, you get a checkpoint. About the controls for controlling the speed of the game, I found it disappointing that it was unclear which button was pressed. It would be really helpful if there is a visual identification to show which button you have chosen. Besides that, there isn’t a lot to do in the dungeon. I found this disappointing, I wish it was a bit more involved. I also felt that the AI of the monsters attacked my character more than your companion. Thankfully, upgrading and improving your character isn’t hard. Each time I trained my character and bought better items, I felt I was able to progress one or two rooms further in the dungeon. Alright, I have to be honest about something. There are some additional things to do in the dungeon. But, I would ruin a surprise for that. So, if you want to know what that is, you should play this game. The only thing I would say is that there should be more moments like those that happen in the dungeon. You are able to heal yourself outside of the dungeon by doing quests. These quests give green pearls that heal you. So, you each time you want to heal, you have to play a mini game. You can’t enter the dungeon without full health either. Now, there is a more involved version of the dungeon and that is the arena in the castle. You can choose between three different tiers and with that you can win an item. Now, you have to press the space bar at the right time to deal more damage. It’s that kind of mini game that you need to press the button when the pointer is in the green area. In the arena, your equipment does not make a difference. So, it’s pure skill based in there. You do have to pay coins to get in the arena. The more difficult the challenge is, the cheaper it becomes. This makes sense, since that way you can’t easy farm the cheap items to have a huge mountain of cash to easily buy the most powerful items. Now, this game doesn’t automatically save, so if you don’t want to lose any progress… Quit the game using the menu in the town. Now, if you reboot the game in full screen, you might notice that there is some graphical weirdness going on. Just go into the options menu, click the full screen option once to go to windowed mode and click it again to go back to full screen. That fixes that issue. 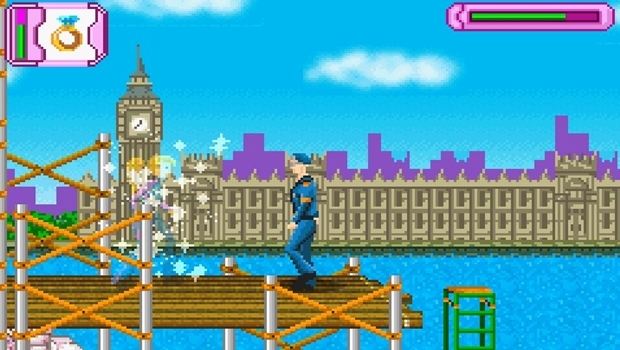 The mini games are vector based mini games. The first mini game you encounter is a top down shooter that reminded me a lot of Asteroids. Each time you shoot a falling rock, the rocks’ drop speed increases. The faster the rock, the more points it gives to completing the quest. Oh, you have to actually do something in the mini games or your character won’t progress in his quest. After a few floors, you unlock the possibility to play another mini-game for a good amount of coins. The 2nd mini game is one where you go downward and you aren’t allowed to touch the edges. I personally highly dislike these style of mini games. Now, this is something personal, but I have never been good at this mini game. Each mini game has 2 achievements. There is the “Good at” and “Great at” mini game. Each achievement is tied to your score. The final mini game felt broken to me. For some reason, the mini game didn’t react on my inputs at certain moments making me loose it. But, that might be because it’s a rhythm-ish style mini game and I’m not that great when it comes to that. Now the other mini games I will leave as a surprise for if you decide to play the game. They are quite interesting, but for some reason I found myself enjoying the first one the most. In this game the Asteroids one is called Planetoids. Now, this game isn’t too difficult. Some people will find this game repetitive, but I found it a relaxing experience. It was a blast to play something where I was able to just relax and I didn’t need to take the game too seriously. The game became even more interesting after a few hours of play, it opened up more. But, I won’t spoil that. This is especially true when you think that the game is repetitive. Don’t worry, something unique and fun will happen near the end. There isn’t a lot of replay value in this game. After you have beaten the game, there isn’t too much different in a 2nd playthrough. This game is also really cheap. So, if you are looking for an cheap enjoyable game; look no further. Yes, I found the game enjoyable. Especially the charm of the visual presentation. It reminded me a lot of Knights of Pen and Paper. The retro feel while not using true 8bit or 16bit visuals is just pretty to me. The game is colorful and lively and just gives off that relaxing vibe. It also has a lot of charm in my opinion. A charm I can’t get enough off. The animations might be basic, they were just perfect in this game. Like the sound effects, they fit the theming of the game perfectly. The music, well, it’s something I would like to add to my playlist of relaxing music. I really liked the soundtrack of this game. That’s everything I wanted to say about the game. I think it’s high time for my conclusion and final thoughts. The game can be a bit repetitive. Some minor visual issues in full screen mode when booting the game. The shop needs some polishing work. The exploration of the dungeon can be boring. Some UI improvements are needed. + Great music & sound design. At certain times, I felt that this game could make for a perfect mobile game. At certain points, I felt like this game isn’t really meant to play in long sessions. This game could be enjoyed more in short sessions. This game has a lot of potential. There are some flaws that could be polished and patched out but they didn’t stop me from enjoying my time with the game. If you are looking for an enjoyable cheap game, I wouldn’t look any further. This is a great time wasting game. The biggest issue I felt that this game has is that the game didn’t had enough gameplay. I wish there was a bit more to do, especially during the exploration of the dungeon. Oh well, not every game can be perfect. I do recommend that you give this game a try and just relax and enjoy the experience. Since, that’s in my opinion the best way to enjoy the game. Thank you for reading this article and I hope you enjoyed reading this as much as I enjoyed writing it. I hope to be able to welcome you in another article but until then, take care and have a great rest of your day. This entry was posted in Articles and tagged 001, advice, arpegi, art, bugs, building, button, buttonsmashers, casual, changes, cheats, computer, creation, difference, Double, easily, easy, ending, English, explanation, facts, fix, free, full, game, gameplay, games, gaming, general, get, grevicor, hacks, how, indie, internet, Jonez, jonez001, lucid, me, mobile, neko, NekoJonez, opinion, own, Path, polish, Preview, review, reviewing, RPG, screen, screenshots, short, space, spoiler, steam, story, stuff, tips, To, tricks, walkthrough, WordPress on December 7, 2018 by NekoJonez.